With the champion and three top ten contenders competing, last Saturday night was a big night for the lightweight division. Yet while most expected a bit of clarity to emerge after UFC 229, a post-fight incident threw the entire weight class back into a situation where the future is, to say the least, uncertain. Then there’s also the upcoming UFC 230 event in November, which will likely see the winner of the Dustin Poirier-Nate Diaz bout make his own case for a crack at the crown. Nurmagomedov’s first title defense was a success on a lot of levels. He scored a dominant victory over Conor McGregor, he handled the blinding spotlight like a seasoned pro, and he established himself as the best lightweight in the game. But with the events after the main event, the next opponent for “The Eagle” will be the Nevada State Athletic Commission. That puts plenty of question marks around Nurmagomedov’s immediate future, but assuming that all works in his favor to make a return according to schedule in 2019, he will be holding all the aces in terms of his next opponent. Will it be McGregor for a rematch, the winner of Poirier-Diaz, or could Eddie Alvarez slip into the mix should he re-sign with the UFC and get a big win early in the year? 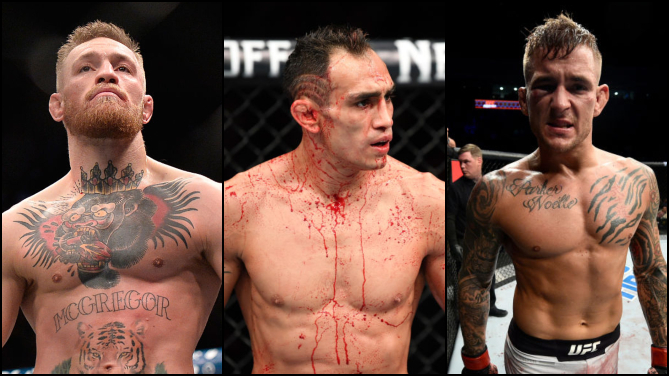 For my money, there’s only one fight to make, and while it’s had a rocky history when it comes to getting both fighters to the Octagon healthy, we can’t help but pray to the MMA Gods that Nurmagomedov and Tony Ferguson finally do battle. That’s a bout with the potential to be the best to ever take place at 155 pounds. McGregor’s bout with Nurmagomedov went the way most expected it to, with the champion’s swarming grappling game being too much for the Irishman to deal with. Yet there were positives to take away from the performance of “The Notorious” one. He did have success defensively at times, his striking allowed him to take a round from his opponent, and the first thing he asked UFC President Dana White for after the fight was a rematch, so his confidence isn’t shaken. And while he probably won’t admit it, the two years’ break outside of the Octagon looked to affect his timing and speed – two things that only staying busy will keep up to par. So can we see a busier McGregor in 2019? Well, like Nurmagomedov, he also has to deal with the Nevada State Athletic Commission, so that clouds his immediate future, but if he does get the green light for a fairly quick return, the best course of action for him may be a rubber match with Nate Diaz, regardless of what happens with Diaz’ UFC 230 bout with Poirier. It’s a fight the fans want to see, it’s a money fight, and it’s an opportunity for McGregor and Nurmagomedov to get a little break from each other, which both fighters would probably agree is a good idea at this point. “EL CUCUY!!!!!! !” As I noted earlier this week, Tony Ferguson had no business coming back so soon from a serious knee injury and looking as good as he did in defeating Anthony Pettis. But he pulled it off and if not for all the talk about the UFC 229 post-fight incident, we may be focusing more on Ferguson than Nurmagomedov this week. He was that fun to watch, and it was the perfect return for the former interim champion, as it reminded us that since a 2012 loss to Michael Johnson, Ferguson is 11-0 with eight finishes and seven post-fight bonuses. If there is one fight to be made at 155 pounds, it’s Nurmagomedov vs Ferguson. Announce it now and wrap them in bubble wrap until fight night, but let’s see this fight next. If I was matchmaker (and no, I really don’t want that headache, so I’m not volunteering), Tony Ferguson gets the next shot at Nurmagomedov and the winner of the November 3 bout between Dustin Poirier and Nate Diaz gets the shot after that. Poirier is not just one of the good guys of the game, but since losing to Johnson in 2016, his resume is pretty impressive as well – 4-0 with 1 NC, three knockouts and four post-fight bonuses. Jeez, Poirier vs Ferguson would be Armageddon in short pants, but let’s get this title picture straightened out first. Poirier has a tough test ahead of him, but should he pass it, there’s only one fight next for him. Having fought the last fight of his current contract against Poirier in July, Eddie Alvarez is in limbo at the moment, which is so appropriate for the state of the lightweight division these days. I am an optimist and an Alvarez fan, so I’m hoping he stays with the UFC and continues to give us the fights he has over the last few years. So assuming he does stay, he made it very clear to me before Nurmagomedov was scheduled to fight Ferguson in April that he’s the one fighter in the division with the tools to beat “The Eagle.” Yes, easier said than done, and with a 1-2, 1 NC record in his last four, the road is longer than most for the former lightweight champ. But at the higher reaches of this weight class, one big win over a top five foe could be the ticket to the title picture. Alvarez vs Kevin Lee? I get into fights for free but I’d pay to see that one. Kevin Lee has been very good for a very long time in the UFC, but it wasn’t until his fifth-round stoppage of Edson Barboza in April that he opened eyes as a legitimate title threat. But with him not in the immediate vicinity of Nurmagomedov, he’s going to have to win a fight or two more to get there. An Eddie Alvarez fight would be a nice start, a rematch with Al Iaquinta isn’t bad either, and then there’s always a meeting with Justin Gaethje, which could be the one to throw him right to the top of the list should he emerge with a win, because not only would it be a victory over a legit contender, but the odds of it picking up some bonus money is high, leading to fans demanding to see “The Motown Phenom” in with the champ. Despite back-to-back losses to Nurmagomedov and Lee, Edson Barboza is still one of the scariest fighters in the division, and with a move down to Florida to train with American Top Team, the Brazilian may just have the jolt he needs for a fresh start. So if I’m helping along with that process, I’m not putting him in with a wrestler. Gaethje? Pettis? Iaquinta? All sound good to me. It’s hard to deny how good Gaethje looked in his August knockout of James Vick, and it was the perfect win for him because he was able to get in and out of there with no damage and another bonus check for his bank account. Now it’s time to start thinking about his next step, and as I’ve already mentioned, there are plenty of great fights for him in the top ten. The question is, who will be willing to get in there with a guy who will either get you out of there early or make you go through a painfully long night, even if you beat him. Yes, Anthony Pettis lost two of his last three bouts, yet “Showtime” has looked like a guy who is not only back to his championship form, but who is enjoying fighting again. That’s a scary proposition for anyone who gets the Milwaukee native next, and it’s good to see him living up to his nickname again. Everyone’s favorite Long Islander may be the mystery man of the division. When he’s on, he’s one of the best in the weight class, but does he want to be a full-time fighter? Let’s hope he does, because he’s got a big upside in the division and a lot of fights that can intrigue the fans and keep “Raging Al” interested. Speaking of divisional mystery men, Nate Diaz is the kind of guy who will never surprise you with what he does. If he decided to walk away from the sport, no surprise. If he stuck around, made a run and won a title, no surprise. That may be frustrating to some, but it keeps us all interested, and if he beats Dustin Poirier in November, we will be even more interested in what the Stockton native has up his sleeve next.